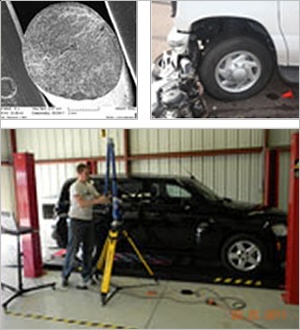 Hannon Biomechanics Analysis Affiliation: Forensic Engineering, Inc.
Forensic Engineering Consulting and Expert Testimony for the Legal and Insurance Industries. Forensic Engineering, with more than 60 years of combined engineering experience and located in Tempe, Arizona, has been providing forensic engineering litigation consulting services to defense and plaintiff attorneys, investigation services to the insurance industry and general scientific and engineering consulting services to industry since 1975. FEI’s laboratory has a full array of tools and instrumentation to investigate simple through complex systems. FEI also has almost limitless facilities for the storage and preservation of evidence and for scientific testing. Dr. Jacobson has had over 40 years of experience in Materials, Mechanical and Design Engineering in both industry and university. Dr. Jacobson was a professor of materials and mechanical Engineering for nearly 30 years where he taught and did research in the technical areas of forensic consulting. Dr. Bosch has had a combination of over 35 years of experience in Mechanical Engineering, Materials Engineering and automotive technical fields. His background includes 10 years of industrial experience, 7 years as an engineering consultant and 35 years as an ASE Certified Master Technician. Mr. Anderson obtained his Bachelor’s degree in Mechanical Engineering with the emphasis of his study in Solid Mechanics and materials Science. Mr. Anderson has provided engineering support in over 92 personal injury/product liability cases in various capacities.